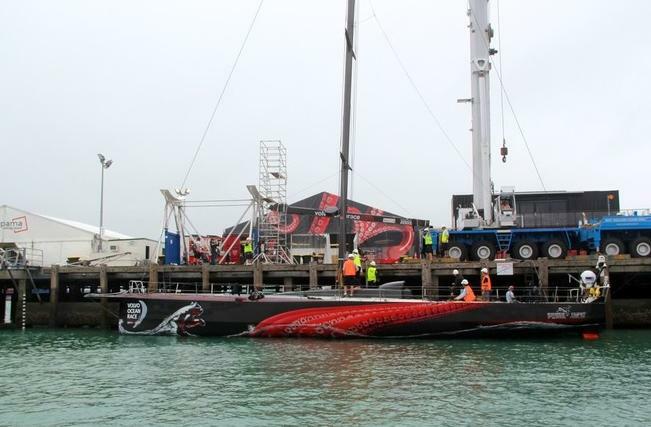 As the fleet battle it out on the way into Auckland, the Race Village is open in the Viaduct. With such a short turn-round time to get the yachts ready to go back in the water, shore crews and associated workers are having a busy time. Perhaps busy is not strong enough – frantic might be more appropriate. The good news for shore and team managers is that none of the Volvo Open 70 yachts suffered serious damage during Leg 4 from Sanya in China. In addition to Groupama’s bow damage, Telefonica did suffer minor damage to the bow after hitting a log or some other floating object (no one is quite sure what it was). Mike Danks, shore manager for Abu Dhabi Ocean Racing, says that his crew are spending very long days working on their entry in the round the world race. CAMPER with Emirates Team New Zealand has the best of it in this Stopover, being in their home base and with the yacht under cover. Shore manager Neil Cox says that a visual and tap survey of the boat brought up no damage with an ultrasound scan of the hull still to be done. The damage to the J2 sail is a little more of a worry. "We have a replacement section coming in from the US and I understand it has cleared Customs so we should receive it soon,” said Cox.“Our other sails are in a dehumidifier drying out." Groupama shore manager, Australian Ben Wright, says that though the sailing crew pushed themselves and the boat hard on the fourth leg, they all came through it unscathed. "We’ve had a thorough look at the hull, and there are no problems," said Wright. "The sails are all good, and we’re up to speed with our general maintenance." Former Sydney-sider Tim Hacket, shore manager for PUMA Ocean Racing powered by Berg, says his team of 20 or so have had late nights already this week. They too haven’t found any major problems and they’ll be ready to go back in the water on Tuesday evening, after rigging is replaced that morning. Team Sanya shore manager Nick Bice says that a visual check of the boat’s hull shows 99 per cent soundness. "We won’t sign it off until the ultrasound is done but it looks good," he said. "We should be back in the water on Wednesday lunchtime." Apart from the small bow problem on Telefonica, shore manager Horatio Carabelli says they have no major issues. "The next job is an ultrasound check of the hull and mast but we don’t expect to find anything we are not already aware of,” said Carabelli. Carabelli expects that his yacht will be back in the water on Wednesday morning. If all goes according to plan with the six boats, the shore teams will have time to adjust rigging and electronic equipment and allow the crew some time to renew their acquaintance with their craft during the Practice Race on Thursday before racing starts on Friday with the Pro-Am series.